A daydreamer...often bumps into things at 60 mph while pondering Earth life instead of a Decepticon attack. Considers Earth one vast lab for his research. His findings are often invaluable to fellow Autobots. Enormous memory storage capacity. Carries a liquid nitrogen rifle with 600 foot range. Twin electron blaster of 20,000 volts can short-circuit almost anything. At 560 mph can stop within 25 feet. Not very fast...often in danger due to daydreaming. Skids is not a character I know very well, unfortunately. Given all of the info, instead of the G1 "Theoretician" , he can be called "New Guy" or the " Independent Contractor" (code for unemployed). After seeing the latest figure, however, I figure I need to read the Regeneration One series to get an idea of his character. So on to the review!! First Impressions: Yes, I will write a first impressions category. You see, I was born in 1972, which made me about 12 years old when wave 1 of G1 came out. I was almost too late from the get-go of the entire Transformers line. Skids came out, I believe, in 1985, which made me 13. I was too old for them and my parents didn't want to buy new toys for a teenager. OK, fair enough. However, I did see the pictures of the original Skids,which I thought was a Dodge Caravan at first glance (not the Honda City that it was modelled after). I thought the design was unusual, but chock-full of good'ol G1 goodness. I left the TF scene for about 20 years, then my interest was rekindled by my nostalgic mind. I wanted part of my old collection back. What I realized was that many of the G1 guys were being reconstructed as both encores (at MUCH higher prices) and a more affordable Classics line. The Classics (as well as Classics 2.0 and Generations) is where I found a new niche. in 2007, I started collecting again. This time with two great leaders ( I had neither in my first collection), and quite a few notable figures. I said all that to say this: when I started my original collection, the G1 dudes were almost all packaged (with the exception of the Minicars) in their alt modes instead of their robot modes. Skids was packaged in Honda mode. Fast-forward some 30 years, and they are all packaged in robot mode. I noticed the aesthetics of this figure were some of the best I've ever seen in this series. He looks TOUGH!! He also resembles Clint Eastwood in the face. Packaging is (as you will see in the "points" section) the major fault of this series. The packaging is devoid of necessary er, what do you call it--- color?! The tech specs are easily readable, however. This reminds me (in robot form) of Classics 2.0 Roadbuster, which I have, but will replace when I can get my hands on the Voyager-class Roadbuster coming out in this series. But in spite of packaging, paint apps are good as well as attention to detail on this figure. Overall, in package, he definitely caught my eye. Transformation: The transformation of this character is largely intuitive. The "shoulder pads" instinctively hide away into the wheel wells, the legs kind of "collapse" into the rear of the car, and the head pulls back and reverses into the trunk. Overall , not incredibly difficult. Some really nice transformation touches are the wrist-mounted lasers. These rotate into place (or not). The positioning of these are rather optional. Alt Mode: As before mentioned, the vehicle this resembles most seems to be the Peugeot 206. The front end somehow takes from the Subaru Impreza WRX STi, but everything else looks Peugeot-ish. I particularly like this design, since the 206 is a very capable race car, and Skids appears to be a very capable Autobot. The weapons can be mounted onto the outside of the car, but if you are a purist for vehicle style, then why add weapons? It looks great with or without. I only wish that the weapons could be mounted--much like Kup and Blurr-- as integral parts of the car. The paint apps are also very nice, with emphasis on blue (or is that teal green?) and red. I'd say this is the best Autobot alt mode since Generations Red Alert. 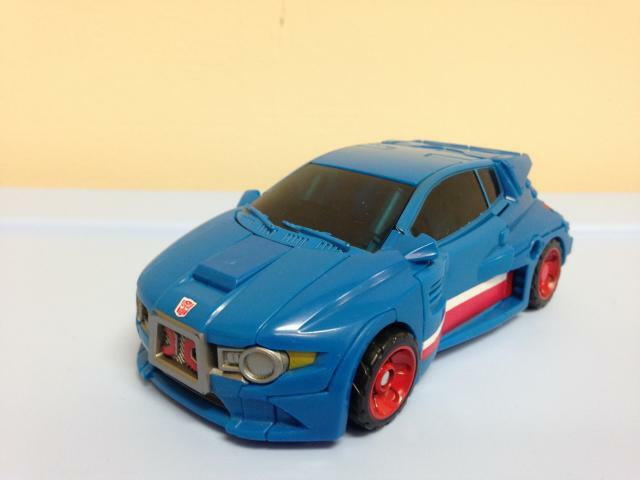 Unlike many previous Deluxes, Skids' alt mode leans a little more to a licensed car. The others close are Prowl, Bluestreak, Red Alert, Sunstreaker, Smokescreen and Sideswipe. 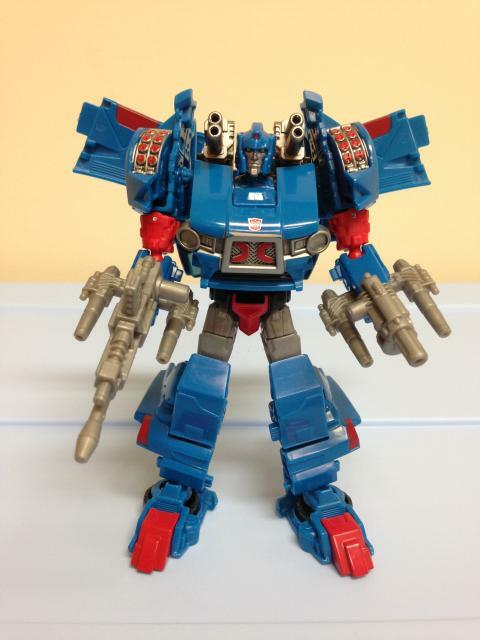 Robot Mode: Skids has one of those robot modes that is rather, should I say, awesome. He is everything one would expect in a Transformer-- from the waist up. My problem comes from the waist down. First, the pros. I like the attention given to his formidable arsenal. You would expect his firepower spec to be 8-9, but alas! a 7 is all he could muster. Nonetheless, I love what they did with the "wrist-mounted" cannons. The rocket launchers on the shoulders are a real plus as well. I love all the extra paint on this guy. The primary teal and secondary silver are really great colors for this figure. One curious observation, however, is in the face. He doesn't look that "young". If this were a human face, I would judge the "owner" to be in his 30's or even 40's (Not that 30 or 40 is old). "Wings " in the back are fitting with the G1 figure, but their awkward to see from the rear. With all going for this figure in the upper half, one wouldn't complain. Unfortunately, I can't say that about the bottom half. Skids has a fairly narrow stance. His knees are hampered by the kibble from the alt mode, thus there is restricted articulation. His feet aren't a disgrace, but this is by far the narrowest of all of my figures around the waist. I can't say I'm outright apalled, just disappointed. Overall ,Skids lives up to his reputation of being one of the most unusual G1 figures. The Generations figure is no exception. Overall: I really think Skids isn't all that bad of a figure. Some of his features are real improvements in the Generations/Classics figures. He has incredible weaponry (one of the biggest pluses of this figure). He has a very decent look to him. The main drawback is the articulation. From the waist down, his knees only bend very little. He cannot make any "squatting" poses due to the kibble. 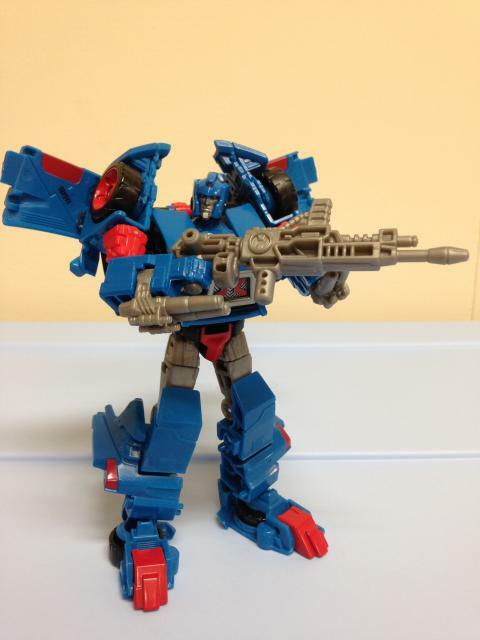 He has a few good weapons poses, but he isn't as good as, say, Kup, Blurr or WFC Optimus for weapons storage. I in no way think this is the best figure of the line, but I think he is light-years from being the worst. That designation was handed out back in the Classics 2.0 line to Galvatron, without even a close second. 1. Transformation: 8 -- Very innovative! I liked the inituition of this transformation overall. 2. Aesthetics: 7-- Good detail. This thing's got firepower EVERYWHERE!!! However, the broad shoulders and tiny waist makes this guy look sort of anemic below the belt. Also , the face doesn't look that young. It looks like a late 40s type of face. He almost looks like Arnold Schwartzenegger . He isn't shameful, I've just seen better. 3. Articulation: 4 -- To be fair, he has articulation from the waist up, The challenge comes from the legs and moving the arms side to side. Knees only bend so far and you can't get good kneeling poses. I have way better figures than this in this aspect. 4. Durability:8-- Most of this figure is solid. With exception of the doors nothing looks like it would break over normal use. 5. Price: 4-- Generations figures , overall, are entirely too high. Although they offer good weaponry, and excellent aesthetics overall, I don't really feel like paying the $16.95 for the average deluxe. 6. Fun: 7 -- Combining weapons, concealed weapons, a fun car mode, great color, what more could you ask for? Better articulation! 7. Packaging: 7 -- Am I the only one that thinks packaging sells? It does or it could be blamed for why things don't sell. I am not really thrilled about Generations packaging, especially the "Thrilling 30". However, they at least have tech specs, something AOE packaging DOESN'T have! (Sorry, no tech specs for AOE Grimlock!). 8. Overall: 8-- Not shameful, but not the best in this group neither. He has strong points for being fun to play with and transform, but given the expectation of these toys have grown over the years to offer better quality in every way, the articulation and overall poseability of this figure leaves it lacking.